We have added a showcase of websites created with Yola on almost every page – and even have a whole page completely dedicated to it. New pages to showcase our features work, and details about our free and paid versions. 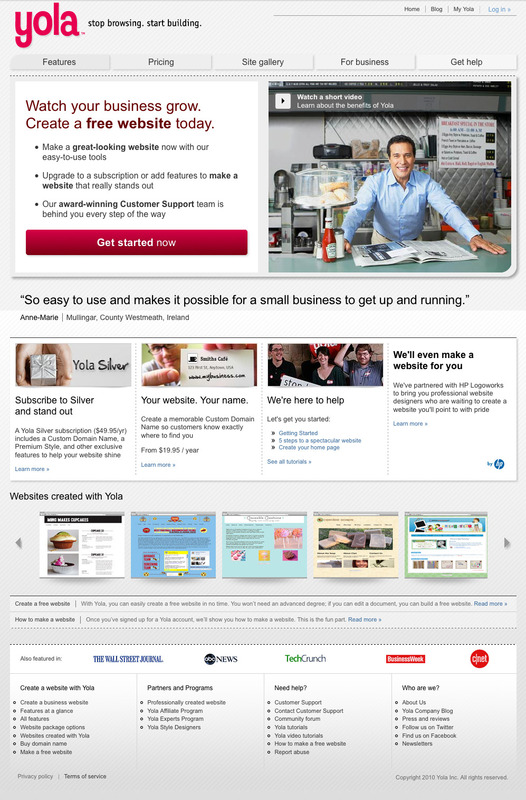 A page dedicated to helping small business owners set up websites for their businesses. And since customer support is such an enormous part of what we do, we also have a completely revamped support page. A new visual look to bring My Yola up to date with our spiffy new website. For those who are interested in the nitty gritty of these things, you’ll notice that we have moved our navigation to the left of the page (it used to be at the top) so that we have more room to add all the features we have planned. A new “Advanced site settings” area where you can now assign any domain as the primary domain for your site – even a 3rd party domain that you’re pointing to your Yola site. We’ll be adding more functionality to this area in the weeks to come. That’s just a short overview of what we’ve been up to in the Website and My Yola areas over the past few weeks. As always, your comments and ideas are welcome! It’s a pleasure to do business with Yola, they are very supportive at all times. Your site address is: marionyork.yolasite.com. For more information on how to promote your site and optimize it for search engines, check out our tutorials. Thanks for your support and recommendations. We really appreciate it!